Posted in: Uncategorized. Tagged: data mining, data science, datasociety, sentiment analysis, social media, Social Media Mining, social scientific research. I (@rheimann) was fortunate to recently (Feb. 22nd) participate as a guest speaker in Data Society‘s Data Science Bootcamp. The bootcamp is four-week long class with 24 hours of instruction time. Other guest speakers were Harlan Harris, Ph.D., Jeffrey Strickland, Ph.D., and Danielle Zeedick, Ph.D..
My talk was a brief 15 minutes chat with students about some of the potentials and pitfalls of social media data and a brief examination of sentiment analysis. I have shared my slides here for reference. Thanks to Dmitri Adler and the rest of the gang at Data Society for hosting such a great event and for the invitation to speak! Posted in: Uncategorized. Tagged: big data, data mining, data science, geography, GIS, NLP, sentiment analysis, social media, Social Media Mining, topic modeling, Twitter, UMBC. These are slides from a recent webinar hosted by UMBC with the help of Keegan Hines. The growth of social media over the last decade has revolutionized the way individuals interact and industries conduct business. Individuals produce data at an unprecedented rate by interacting, sharing, and consuming content through social media. However, analyzing this ever-growing pile of data is quite tricky and, if done erroneously, could lead to wrong inferences. These slides provide, by example, insights to mining social media data and exposing underlying latent structures relating to ideology and sentiment as well as space and time. This work respectfully explores the rather socially critical and sensitive topic in and around the tragic events of the Newtown Shootings and gun control in America. Analyzing Social Media Data with R Workshop | District Data Labs | Sign up NOW! Posted in: Uncategorized. Tagged: data mining, data science, district data labs, network analysis, NLP, rstats, sentiment analysis, social media, Social Media Mining, topic modeling, workshop. This beginner-to-intermediate level course will introduce you to various topics in social media analysis. Attendees will begin by learning social-scientific groundwork for understanding measurement and inference, and then demonstrate, through concrete examples using R, how to explore, measure, visualize, and communicate various aspects of social media. 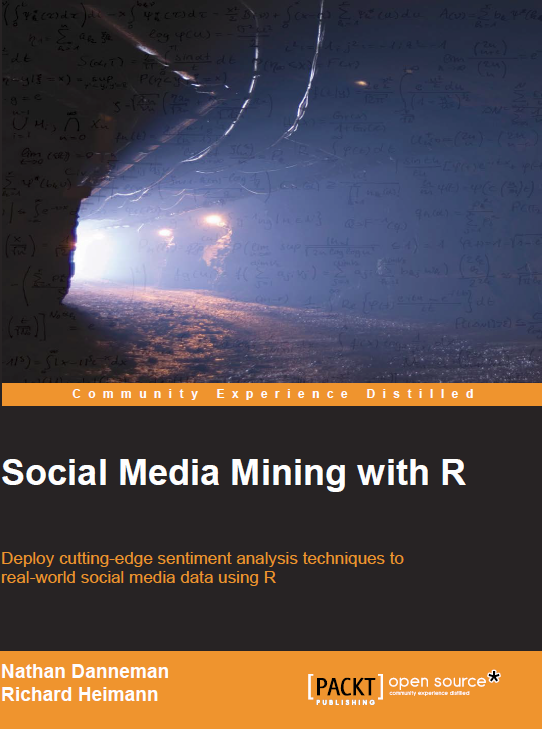 The course will be taught using parts of the instructors’ book, Social Media Mining with R, but will include important additions such as topic modeling and social network analysis. Conceptually, students will learn about the potentials and pitfalls surrounding the measurement of socially generated data. Concretely, students will learn how to scrape, parse, and visualize textual and other classes of social data via both static and hands-on examples. The course will then move into the analysis of social data, including the areas of topic modeling, sentiment analysis, and social network analysis. Within Social Network Analysis, student will learn the basics of social networks, how to calculate individual and network statistics using R, how to visualize networks in R, and advanced uses of social network analysis. Students will come away with hands-on experience, and R code that can be built out to serve their future needs. After taking this course, students will be aware of the possibilities and limitations inherent in social media. They will be able to obtain social data at medium scales, various add-on packages. Nathan Danneman is Fellow and Data Scientist for L-3 Data Tactics, where he has worked on sentiment analysis, geospatial anomaly detection, and behavioral cyber analytics. He holds a PhD in political science, and has an extensive background in causal modeling and game theory. During his graduate work, Nathan taught introductory statistics courses, and served as an on-campus consultant for quantitative theses and dissertations. Nathan has created novel sentiment analysis applications, and is a co-author of Social Media Mining with R.
Richard Heimann is Fellow and Chief Data Scientist at L-3 NSS. He also is an EMC Certified Data Scientist with concentrations in spatial statistics, data mining, and pattern discovery. He is an Adjunct Faculty at the University of Maryland Baltimore County, where he teaches Spatial Analysis and Statistical Reasoning, and an Instructor at George Mason University, where he teaches Human Terrain Analysis. Mr. Heimann recently provided data science support to customers, including DARPA, Department of Homeland Security, US Army, Counter-IED Operational Integration Center, and the Pentagon. Richard is a co-author of Social Media Mining with R.